Electric knife sharpeners are a relatively more recent addition to the market than manual ones. The question is: Do electric knife sharpeners work better than manual ones? Unfortunately, they have had quite an unfortunate history so far. You may have heard reports of them knocking off blade edges and ruining several knives in a row. However, these days are in the past now and we’ve seen a lot of progress since then. So do electric knife sharpeners work? In the current present, they absolutely do. There are several benefits to using electric knife sharpeners. We’ll be discussing these and comparing them to manual knife sharpeners below. This would make it easier to decide which one to get. Click on image to check lowest price. Chef’s Choice Trizor XV is the best 15-degree electric knife sharpener in the market. Received more than one thousand reviews on Amazon. There are several reasons to make use of an electric knife sharpener. They’re quick at their work, in one to two minutes. You can hence get all your kitchen knives sharpened and ready for work in no time. Next, a high-quality electric knife sharpener would sharpen knives without any flaws. This means no denting, bending, or broken edges. A knife needs to not only be sharp, but accurate in its cutting. Thirdly, the electric knife sharpener is very easy to use. It may be a little bit different than the working of a manual knife sharpener. However, once we take the pain to understand the directions and follow them closely, the sharpening is a breeze! Read the instruction manual first before operating the electric sharpener. Last but not least, an electric knife sharpener has several slots or multiple stages. These would adjust the fineness of the blade in order to suit our every need. Whether we need a very fine blade or a coarse one, an electric knife sharpener can get us what we want without the extra effort. Which Kind of Sharpener Would Work for You? Knife sharpeners on the market today could be broken down into two main categories. These are manual and electric sharpeners. The manual knife sharpener is a gadget that allows us to pull the knife manually through certain slot. For this, we have to put in quite a bit of effort. The manual sharpener itself is quite small, perhaps no bigger than the knife itself. An electric knife sharpener, on the other hand, needs to be plugged in to work. It’s a bit larger than a manual one, around half the size of a regular toaster. With such an appliance, you can simply pass the knife through the slots. The machine itself would align the knife and sharpen it within minutes, if not seconds! This method is much quicker and simpler, but it requires an electrical connection and a certain amount of care. The maintenance of the machine, such as emptying the shavings bin, is also necessary. There are several options for both kinds of sharpeners in terms of price, quality, and size. However, we must make a decision to use at least one of these. Cutting with dull knives is definitely not a good idea. It’s a dangerous practice and unnecessarily frustrating. 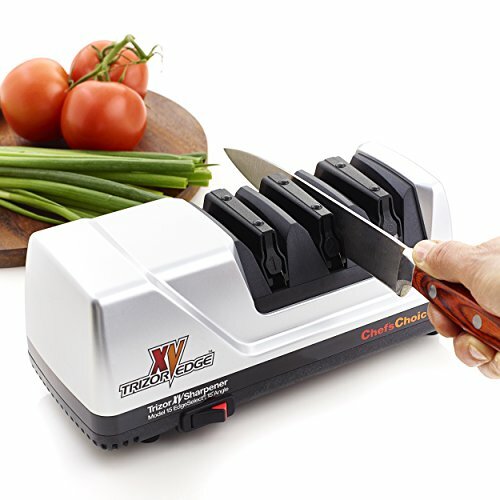 If you have decided to buy a high-quality electric knife sharpener, go for the Chef’s Choice Trizor XV Pro. Or at least check out the Trizor review. Both kinds of knife sharpeners have their pros and cons. It’s hence recommended that one could buy both if they can. However, if we have to choose just one, we should look at what our needs are. We should also consider our personal preferences. Below are some general factors we should consider when deciding between the two kinds of sharpeners. If you’re a novice cook, you may think that all knives are the same. This is not true, knife experts can prove you wrong. The quality of the knife does make a difference. Apart from serrated and straight blades, there is also a difference between American and Asian blades. Conventional European and American knives have 20-degree angle and Japanese style knives have 15-degree. The kind you have would determine which knife sharpener you want to purchase. Fortunately, there is also an electric model to restore both types of blades, Chef’s Choice 1520 Angle Select. Manual knife sharpeners are usually cheaper than electric ones. However, the prices may be just as high as electric sharpeners if you go for a very high-end brand. Usually, you can get a decent manual knife sharpener for ten or twenty dollars. Even the most expensive usually won’t go beyond sixty dollars. 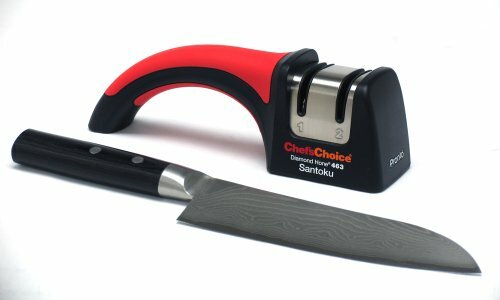 Chef’s Choice 463 – 2-Stage Manual Knife Sharpener. Click on image to check lowest price and review. On the other hand, electric knife sharpeners could cost you quite a bundle. If you go for a cheap option, it may need a lot of repairs and would probably not last as long as a manual one of the same price. So if you’re on a budget, a manual knife sharpener is probably the better investment. If you want to buy only the manual knife sharpener, check out Chef’s Choice 4643 Pronto Pro Diamond Hone Manual Knife Sharpener. Many modern small families are now living in apartments instead of big houses. As a result, the kitchens are also getting smaller each day. Most of us simply cannot afford to have large appliances taking over the precious counter space. Nor do we have the storage space to accommodate them. An electric knife sharpener may not be too large, but it may be too much for someone who’s really strapped for space. If this is a huge issue, a manual sharpener may be best. If we fulfil one factor in our knife-sharpening needs, we may have to compromise on another. For instance, we may get a sharpener in our budget that doesn’t work well with the kind of knives we have. On the other hand, an expensive state-of-the-art electric knife sharpener may prove just too difficult to manage or take up too much counter space. We’ve already established that electric knife sharpeners do work, and work well. Now, it’s just a matter of choosing whether to get a manual or electric sharpener. After that we can focus on buying the best brand or make. There are several electric knife sharpeners on the market today, Chef’s Choice, Wusthof, Work Sharp, KitchenIQ, Linkyo, Presto, and many more. However, they aren’t all the same in price, quality, or performance. A good electric knife sharpener isn’t likely to be cheap, so make sure you do the proper research before placing an order for one. The best way to select the perfect knife sharpener would be to see what the experts and customers say. Hence, reading the customer reviews and expert recommendations should be a definite part of your research. When you do make the choice that’s best for you, you’d be sure to have a happy and hassle-free cutting experience for a long, long time!